Rediff.com » Business » How are 'minorities' allowed tax benefits under HUF? How are 'minorities' allowed tax benefits under HUF? Should the Income-Tax Act have been simultaneously amended to exclude Sikhs and Jains from the definition of HUF once they were declared a minority by the government? Sanjeev Nayyar discusses the curious dichotomies in our laws. According to a Business Standard report of December 22, Decoding the business empire of the Badals, there exists a Badal HUF and Sukhbir Singh HUF with the latter being the largest shareholder in Metro Eco Green Resorts. The author wondered how the Badals, followers of Sikh religion, have a Hindu Undivided Family that as the name suggests should be applicable to Hindus only. After all, notwithstanding the very close social and cultural relations between Hindus and Sikhs, government and courts consider Sikhs to be a minority today. Therefore, can a non-Hindu community claim tax benefits under the provisions of Hindu Undivided Family? But first, what is an HUF? It comes into effect only after a person gets married. Children born thereafter automatically become members of the HUF. The HUF is recognised by the income-tax department only when there is an income-generating asset. Once recognised, it gets a separate Permanent Account Number and is taxed separately. They too can avail of tax deductions under the Income-tax Act. If structured sensibly HUF can become an efficient tax planning tool. Who can form an HUF? According to the income-tax department, Hindus, Jain and Sikh families are treated (external link) as HUF under the Act. How can one be declared a minority otherwise, and a Hindu for tax purposes? While drafting the Indian Constitution and for decades thereafter, Sikhs, Buddhists and Jains, belonging to religions of Indian origin, were considered part of the wider Hindu community. Article 25 (Right to Freedom of Religion) reads, "In sub-clause (b) of clause (2), the reference to Hindus shall be construed as including a reference to persons professing the Sikh, Jain or Buddhist religion, and the reference to Hindu religious institutions shall be construed accordingly." It was then implied that minority meant Muslims, Christians and Parsis while Buddhists, Jains and Sikhs were considered to be part of the larger Hindu community. Therefore, the Income-tax Act allows Sikh and Jain families to be treated as HUF. As a consequence, the Hindu Marriage Act is also applicable to the four communities. However, during the United Progressive Alliance rule, Sikhs got the right to have their marriages registered under the Anand Marriage Act 1908 instead of the Hindu Marriage Act. When were Sikhs and Jains declared a minority? Prior to the 2014 Lok Sabha elections the Congress party declared Jains a minority. Buddhists and Sikhs probably became one after the National Commission for Minorities Act was passed in 1992. Note that “when Akali leaders approached the then Prime Minister, Morarji Desai (PM from 1977 to 1979) and Deputy PM Charan Singh to declare Sikhs a minority community, both turned down the request on the grounds that they regarded Sikhs as a part of the Hindu community.” A History of Sikhs, Volume II by Khushwant Singh. According to a Reserve Bank of India circular (external link) on priority sector lending, dated July 1, 2015, "minority communities considered are Sikhs, Muslims, Christians, Zoroastrians, Buddhists and Jains. Sufficient care may be taken to ensure that the minority communities also receive an equitable portion of the credit." In this way Sikhs and Jains are considered as Hindus for the purposes of HUF but minorities to avail of government subsidies, constitutional benefits under Articles 29 and 30 and bank loans to these communities are considered as priority sector lending by the RBI. A similar situation exists in Punjab where Sikhs are in a majority at the state level but a minority at the national level. The Supreme Court recently asked, "Are Sikhs a minority in Punjab?" while hearing a petition from the state government seeking minority rights for Shiromani Gurdwara Parbandhak Committee-run institutions. The question that needs to be asked is, should the Income-Tax Act have been simultaneously amended to exclude Sikhs and Jains from the definition of HUF once they were declared a minority by the government? Such dichotomies arise because terms are left undefined in the Constitution, for eg, the word minority. A similar anomaly exists in the case of Scheduled Tribes who convert. According to section 10 (26) of the Income-Tax Act, "A member of a Scheduled Tribe, as defined under clause 25 of Article 366 of the Constitution, who resides in the states of Arunachal Pradesh, Manipur, Mizoram, Nagaland and Tripura is exempt from paying income-tax on any income which accrues or arises to him in these states". However, when an ST converts to Christianity he continues to be considered as ST for the purposes of income-tax exemption and government subsidies. 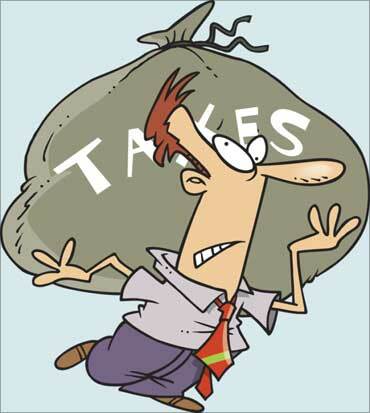 Tax laws should be the same for all Indian citizens. Religion, caste or tribe should not be the basis for giving benefits. Discrimination on account of religion, caste or tribe should be prohibited. Benefits should be given on the basis of backwardness measured by income and educational deficiency only. This thought was reiterated by the Supreme Court in its order of January 2 where CJI T S Thakur said, "The State being secular in character will not identify itself with any one of the religions or religious denominations. This necessarily implies that religion will not play any role in the governance of the country which must at all times be secular in nature." It is a different matter that the word 'secular' is not defined in the Constitution. Read 'Why Secularism is not an Indian concept? Sanjeev Nayyar is an independent columnist and chartered accountant. He tweets @sanjeev1927.